Among the first works in Llyn Foulkes’ current retrospective at the New Museum is a video of the artist/musician singing and playing his “Machine,” a home-built contraption of car horns, cow bells, drums, and xylophone. Ornery, cynical, rebellious, and most of all honest, his music sets the tone for an exhibition of nearly a hundred works spanning five decades. Like his contemporaries and fellow Californians Ed Kienholz and Bruce Conner, Foulkes cut his artistic teeth on surreal assemblages in the late 1950s. But as a storyteller, Foulkes has proved to be more of a straight shooter, turning the medium increasingly to his own rhetorical battle against the evils of power and corporate brainwashing. Today, his early mixed-media works depicting raw landscapes and hieratic figures feel haunted, but also a bit studied; many of these meticulously somber works include a Jasper Johns-type frieze of alphabets or small, repeating images. In the mid60s, the artist hit his stride with his own brand of Pop: large paintings of cows, pigs, and especially rock formations, sometimes presented serially in a single work, with eerily dematerialized textures produced with a rag. 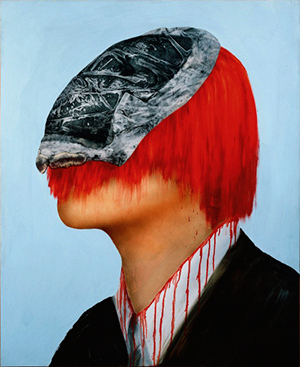 Despite (or more likely because of) the acclaim of the “rock” paintings, Foulkes turned to greater provocations in the 70s: ghoulishly bloodied and distorted heads, mostly obscured by corporate logos, masks or dollar bills. Highly inventive in technique, they combine paint, wood, paper, photographs, and actual objects like neckties and envelopes. Elements often extend beyond the frames, which the artist has fashioned himself out of old, reversed frames and other found objects. Some of the heads vilify icons of American culture such as Ronald Reagan and Walt Disney. But these works are more than cranky diatribes; Foulkes’ gift for color and composition impart to many a peculiar pictorial weight. In “The Broken Window” (1974), for instance, an evanescent blue-green background turns the dense darks of the figure’s shoulders into sturdy hills. Perched above, the elongation of the ruddy head is itself uncannily bisected by a horizontal photo of a white wall. In the 13-foot wide “The New Renaissance” (1991), Foulkes’ almost classical measuring of details and intervals imparts gravity to a work of wildly disparate techniques (from swelling, sculpted mounds of paint to cartoon-like outlines) and extravagant imagery (which includes a crucifixion on a Santa Monica telephone pole). Sometimes Foulkes’ intimations feel scattershot. In “Day Dreams “ (1991), the image of a pistol floats above a slumbering man in a thought-balloon made of real cotton, while a ghostly Superman reads a bedtime story; viewers may well conclude that less would have been more. Foulkes’ frames effectively set the stage for his bloodied heads, but in several large tableaux paintings produced since the 80s–works as vast and three-dimensional as dioramas—the staging becomes all. These are really installations discarding the particular disciplines of painting and sculpture, and while revealing immense labor, they’re for me less challenging. It’s as if the artist’s alienation has found its comfort zone, and we’re left to browse. This review originally appeared in the August 20, 2013 issue of CityArts.